Would you believe I have never been to a wedding before? Well that’s going to change soon! Next month my lovely friend Kezia is getting married and I‘m trying to figure out what to wear. Since winter in Australia is usually unpredictable I‘ve gone for mainly long dresses to keep my legs warm but still going with a vintage summer vibe. I needed inspiration so jumped onto my favourite sites; Topshop, ASOS and Dotti to have a look around here are the results! The first thing I think about wearing to a wedding is floral. I don‘t know why, maybe its the innocence and elegance about floral dresses that perfectly sum up weddings. Flowers are what you give to people who you love, they show growth and beauty exactly what a wedding is about. Wear that metaphor! I usually see light toned dresses so I mixed it up a bit with a few darker pieces. With it being a winter wedding I feel you can get away with it more and mix and match. The dark dresses do have the pops of colour or white in them which catches the eye. While the dark blue would just go perfectly with my skin tone and create more of a balance. I do love the lighter dresses however, none pure white as we don’t want to wear the same colour as the bride! If you can tell I love dresses that are more fitted around my waist as it’s one of my favourite areas, plus they are lot more flattering on me. It’s very easy for my shape to be lost in fabric so I need to pay attention the shape of a dress. Then it’s either a flowing skirt or skin tight haha. I go for more fitted dresses if I want to be more elegant and formal. Flowing skirts do work for elegance as well and they allow for more movement and accentuate my hips. It will depend on my mood at the time what style I choose in the end! I have to go with a midi skirt or maxi dress. I’m in love with midi‘s so my eyes will be caught by them more, plus they just give a more formal approach. With a wedding I think you’re totally allowed to splurge some more. While I wouldn’t normally spend over $60 for a dress I’d make an exception! Plus with a lovely looking dress I’m sure you could get a lot more use out of it! Networking events, dinners and birthdays could all be a great way to wear it out again! Shop wise I picked Topshop, ASOS and Dotti as I shop at these places often and know the quality I’m gonna get. What was great about Topshop and ASOS was that they both had selections of dresses directed at wedding guests. Which was perfect for me as I had no clue where to start! I give them props for that! 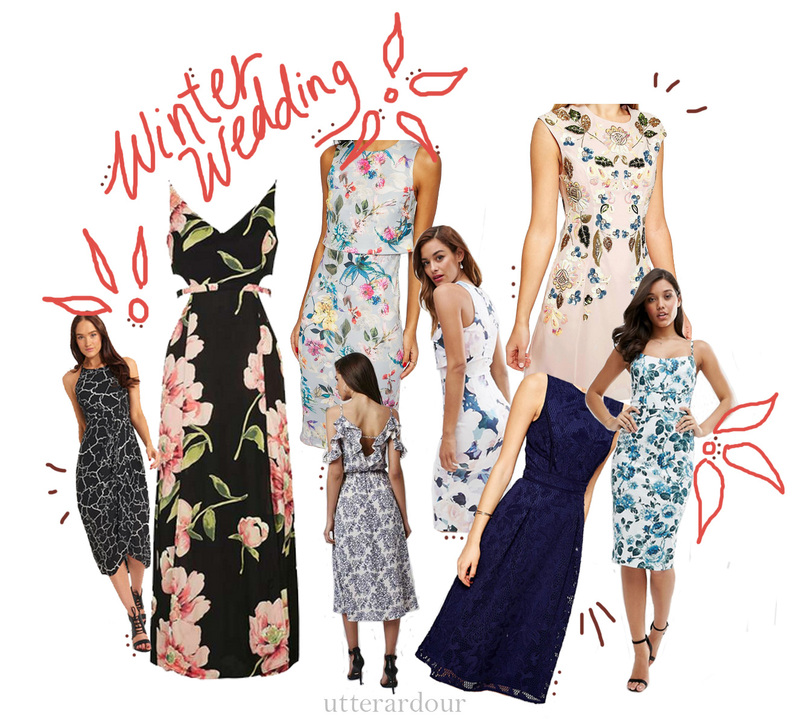 Let me know what you think is the perfect winter wedding dress! I need all the help I can get! What is your favourite from above?